Santa Cruz holds a special place in my heart. It’s not the most curated of California’s beach towns, but it has a certain charm and beauty that leaves you wanting more. Perhaps it’s the ultra chill, bohemian vibe that makes you slow down and take it all in. Perhaps it’s the deep-rooted, surf culture that makes you want to hit the beach and play in the waves. Or perhaps it’s the not too big, not too small feeling of a college town that has the right mix of cultural interests balanced with nature and outdoor pursuits. Whatever it is, surf’s up in “Surf City!” So grab your family and head to one of California’s most iconic beach towns for a true vacation of California dreamin’. Taking a stroll on West Cliff Drive is a must. Locals call it “cruising the cliffs,” and you’ll see why as the path that parallels the coastline is full of people walking, running, riding cruiser bikes, and carrying surfboards. Stop and take in the view of long boarders at Cowell’s Beach. The easy, fun waves at Cowelll’s make surfing accessible to everyone, as you’ll see both young and old ascending the beach steps with smiles of satisfaction. Surfboard rentals and lessons are offered at many local surf shops, so watch out, as you may find yourself catching your own waves! Cruise about a 1/2-mile down from Cowelll’s, and you’ll discover why everyone’s gazing over the edge. Steamer Lane or as locals call it, “The Lane,” is a world-class surf spot. Home to the famous Cold Water Classic surf competition, you’ll find high performance surfing at its best. KidTripster Tip: Want to try surfing? Head to Cowell’s Beach Surf Shop, right across from Cowell’s Beach, for all things surf-inspired. 2-hour lesson cost: $90, includes board and wetsuit; no experience necessary. 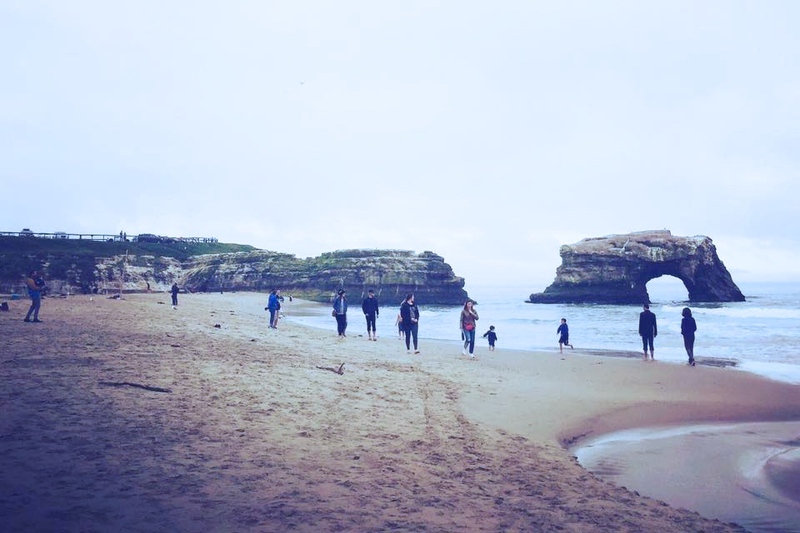 After a cruise on the cliffs, grab a picnic and head down to Natural Bridges State Beach. The stunning natural bridge rock formation along the shore is the perfect backdrop for a family photo and beach exploration. On our trip, we were lucky enough to see a school of dolphins playing in the surf. From October through February, thousands of monarch butterflies migrate here to winter in the eucalyptus groves that border the trails. Above Natural Bridges State Beach, you’ll find the Seymour Marine Discovery Center. Operated in conjunction with the University of California-Santa Cruz, the center is the perfect place to let your little ones get intimate with the incredible marine life that’s found in Monterey Bay. We touched the sandpaper-like skin of a swell shark, and I couldn’t get my son’s little hands out of the invertebrate pool of sea stars, sea anemones, sea urchins, and more! Cost: Youth (under 2) Free; Youth $6; Adult $8; check the center’s website for free community days. KidTripster Tip: Sign up for one of the complimentary, guided tours on arrival. The knowledgable guides will take you around the Seymour Center and parts of the Long Marine Lab. That's where you’ll see the world’s largest animal. Well, at least the skeleton of the world’s largest animal! Can you guess? A blue whale! After our trip to the Seymour Center, we wanted even more aquarium time. So we made a trip to the incredible Monterey Bay Aquarium, located less than an hour’s drive south of Santa Cruz. Home to more than 35,000 animals and plants showcased in 200 galleries and marine exhibits, this world-class aquarium highlights the amazing habitats of the Monterey Bay. Our favorite exhibits were the kelp forest and the jellies. Massive schools of sardines flitter through the water as giant sea bass and sharks float through towering kelp forests. It was beautiful. My son couldn’t get enough of the jellyfish exhibits. Like works of abstract art, these mesmerizing creatures move in and out of their shapes to form live, ever-changing compositions. Incredible! We left feeling so inspired by our visit here and can’t wait to come back. Cost: Youth (2 & under) Free; Youth (3-12) $29.95; Youth (13-17) $39.95; Adults $49.95. Driving back into Santa Cruz, we saw about five different cars with the same yellow and black bumper sticker that read, Mystery Spot. The Mystery Spot? What’s that you ask? Our thoughts exactly. We decided to check it out. As it turns out, this is one of the most popular tourist attractions in Santa Cruz and for good reason. It’s a fun, quirky spot where gravitational anomalies and indescribable phenomena happen. Scheduled, interactive group tours with witty guides take you through the property to experience these mysteries. You’ll leave smiling and scratching your head. At the end of the tour, the guides pass out the famous yellow and black bumper stickers, so that you, too, can spread the mysterious Mystery Spot love! Cost: Youth (2 & under) Free; Other $8; Parking $5; active military members are free. 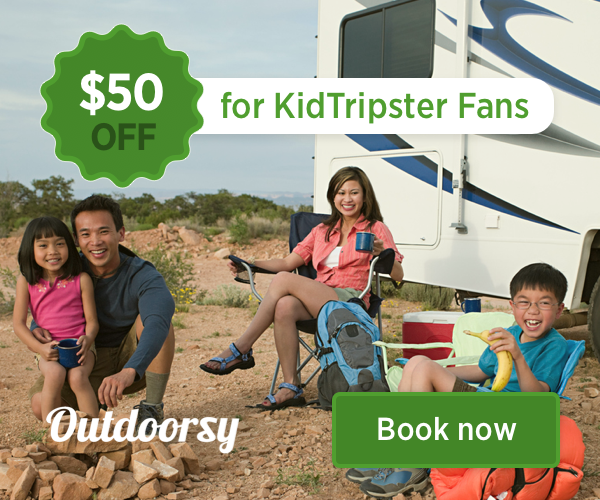 KidTripster Tip: Buy tickets online in advance, as popular tour times tend to sell out. All aboard! Is anyone in your family obsessed with Thomas the Tank Engine? If so, then a visit to Roaring Camp Railroad is a must. And even if there’s no Thomas obsession in your family, it’s still a very unique and memorable experience. The adventure begins when you arrive at the Roaring Camp, where you’ll be immediately transported to an 1880s Western logging town. There are interactive activities for kids, games, re-enactments, shopping in the general store, and food options to get you in the spirit as you wait to board the open-air, steam locomotive. The main attraction is the one-hour (round trip) route that takes you through the redwoods and up Bear Mountain. From June through December, there’s an additional option on the beach train that takes you from the Santa Cruz Mountains to the Santa Cruz Beach Boardwalk. Main train cost: Youth (under 2) Free; Youth (2-12) $22; Adult $29; Parking $10. Beach train cost: Youth $25; Adult $31. The Santa Cruz area is known for epic mountain biking; a well-known bicycle company even bears the Santa Cruz name. But if you’re not careful, you could find yourself out of your depth. That’s why you need a guy like Dave Smith of Shuttle Smith Adventures. Dave is a 50-something with the attitude and skills of a 20-something. A bit of a local legend, Dave runs mountain bikers up to the top of The Forest of Nisene Marks State Park to the not-easy-to-find start of your mountain bike adventure. Here, serious mountain bikers can take an unguided or guided tour with Dave through the single track loops of Soquel Demonstration Forest. Hear me when I say that you need to be an experienced rider to tackle these trails. However, you and your older kids (who are confident on bikes) can still enjoy this very Santa Cruz pastime. Start at Epicenter Cycling in Aptos, just a 15-minute drive from Santa Cruz. Here the expert staff will hook you up with mountain bikes to match your family’s ability level. Then Dave will load those bikes in his party bus and drive you up the mountain. You’re about to embark on the 15-mile Fire Road along Aptos Creek. However, the first two miles of your ride is uphill. I’m not going to lie; it was grueling. While my teenaged sons rode up, my husband and I pushed our bikes most of the way. Phew! However, once we reached the top, it was all downhill from there. While it is a fire road, there are plenty of rocks, roots, and steep drop-offs to keep you on your game. I was so dialed in on what was immediately in front of me, I hardly noticed the forest of towering redwoods that surrounded me. The top half of the ride is steep, as in you’re braking nearly the whole time. After a break to admire the ocean view, you’ll find that the second half levels out a bit more, and you’re able to breathe a little easier. At the very bottom, you’re riding through the campground pass hikers and some (insane) bikers headed up the trail. You end back at Epicenter and promptly walk over to Aptos Street BBQ for some well-deserved barbeque. Despite the initial exertion, my husband and I really enjoyed the ride. My sons, of course, finished 20 minutes ahead of us, with bragging rights. Bike rental cost: $40-$80, depending on bike type. KidTripster Tip: If your kids are going to ride ahead of you, make sure that they stop and wait at any fork in the road. Ours didn’t, and my husband and I have some anxiety-filled moments where we wondered if the kids were lost in the woods. KidTripster Tip: I can’t emphasize enough how accommodating Dave was. We were traveling with our dog and were concerned about leaving him for several hours. Dave offered to bring our dog to his house near Epicenter Cycling, where our pup spent the day in his fenced yard with his two friendly dogs under the watchful eye of Dave’s wife. Also, if you don’t have a car to drive to Epicenter Cycling, Dave will pick you up! Cost: Shuttle only $25; Guide tour: $50/hour. Located across the street from the iconic Santa Cruz Beach Boardwalk, The Picnic Basket is the perfect spot to grab lunch and then hit the beach. I feasted on a delicious salad of organic field greens, sprinkled with nuggets of candied almonds, goat cheese, prunes, and bacon. It was the perfect mix of sweet and savory. My husband found his way to a robust reuben, and my son polished off an all-natural, beef hot dog. KidTripster Tip: The Picnic Basket serves ice cream from Penny Ice Creamery. If you don’t make it to original store downtown, grab a scoop here. When you’re downtown, however, make a point to go to The Penny Ice Creamery. Don’t be discouraged by the lines out the door. It’s worth the wait! With original, rotating, artisan flavors - like Buttermilk Rhubarb (sounds strange, but it’s delicious! ), Coconut Key Lime or the incredible Chocolate Malt - you simply can’t go wrong. Another downtown, not-to-miss spot is Zoccoli’s. This family-run establishment is packed with patrons happily enjoying their Italian-inspired sandwiches and simple pasta dishes. Snag a table outside along the tree-lined sidewalk. Between the Santa Cruz sunshine, delicious Italian lunch, and entertaining people-watching, your time at Zoccoli’s will be memorable for sure. Charlie who? Charlie Hong Kong. You heard right. Charlie Hong Kong! This off-the-beaten-path spot is a local favorite, specializing in healthy, Asian-inspired dishes. It serves scrumptious noodle bowls with organic veggies and your choice of savory protein options. My toddler grubbed on the Pad Thai bowl topped with teriyaki chicken. Try the fresh, house-made ginger lemonade for an extra special treat. The two best places to stay in Santa Cruz? Undeniably, Dream Inn and Hotel Paradox. Both have different things to offer families, but both are equally amazing. At Dream Inn, every room boasts an ocean view! This boutique hotel is just steps to cruising the cliffs on West Cliff Drive, making the location unbeatable. The hotel was recently renovated, and it’s nailed the modern-meets-beach house, surfer vibe. The retro chic-themed rooms are dressed with mid-century cabinetry, light fixtures, and colors that pop, like yellow bathroom tile and blue, graphic-printed wallpaper. It’s fun and whimsical. The hotel just puts you in a good mood! And outside, it doesn’t get much better than an umbrella cocktail with an ocean backdrop, while watching your kids play in the very family-friendly pool. Rates start at $179/night. 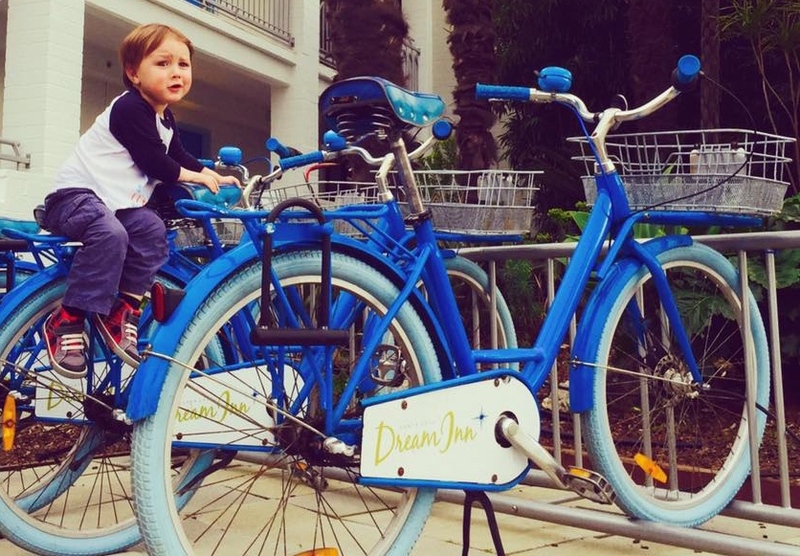 KidTripster Tip: Grab one of Dream Inn’s complimentary cruiser bikes and ride West Cliff Drive or head to the boardwalk and wharf. 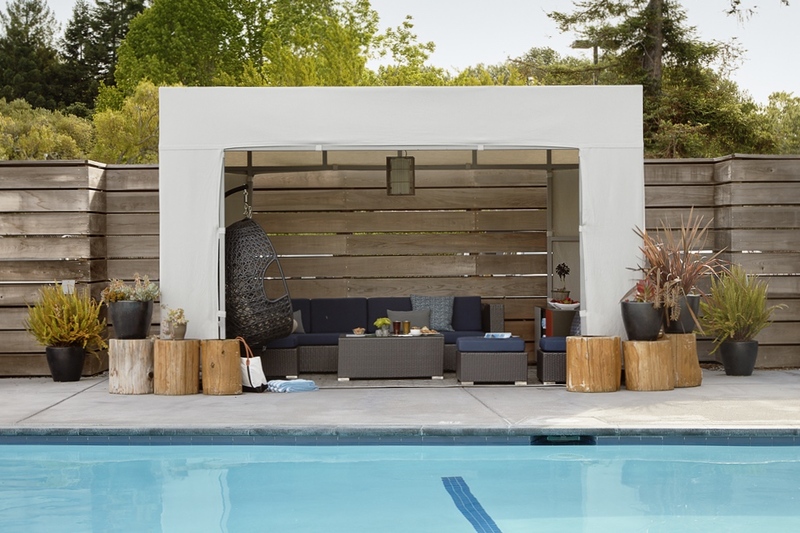 If the beach vibe isn’t your thing, then downtown Santa Cruz’s Hotel Paradox will exceed all your expectations with an upscale, but casual flair. As part of Marriott's Autograph Collection of boutique hotels, the Paradox’s service and attention to detail is unmatched. Artful, playful, stylish, and design-forward, the Paradox is a delight for the senses. The foodie in your family will be pleased with the high quality dining and drink options. Solarie Restaurant + Bar is not only very kid-friendly, but it’s also foodie-approved. Make time for playing and relaxing at Paradox’s chic outdoor, heated pool. Rates start at $189/night; complimentary cruiser bikes also are available. KidTripster Tip: The private poolside cabana rentals take pool time to a whole other level. Cost: $100 for 4 hours; Marriott’s Platinum Rewards members get free unlimited access. If you spend $200 on food and beverages at Solarie Restaurant + Bar, the cabana rental fee is waived. If you happen to be cruising the California coastline in an RV, head to Santa Cruz Harbor RV Park (Brommer St. & 7th Ave.) Yes, it’s basically a parking lot with full hookups, but hear me out. Your spot overlooks the Santa Cruz Marina. Just a 5-minute bike ride through the marina, you’ll find yourself at the channel to the ocean with a lighthouse and long stretch of uncrowded beach. It’s really a spectacular location! Rate: $52/night. KidTripster Tip: This park is a little tricky to find. Approach from Brommer Street. The nearest major airport is San Jose International Airport about 30 miles northeast of Santa Cruz. San Francisco International Airport is approximately 60 miles north of Santa Cruz. By car, Santa Cruz is easily accessible via Highway 17 through the Santa Cruz Mountains or via California's scenic Highway 1. Take your time and be cautious when traveling on Highway 17, as the two-lane road has very narrow shoulders and winding curves; it can get quite congested. Julie Connell lives in Bend, Oregon, with her husband and two young sons. When not dreaming about the next travel adventure for her family, she can be found working on her other passion project, cooking. Her latest obsession is making small batch, artisan granola. Editor Shellie Bailey-Shah also contributed to this article. Writers received complimentary stays and activities for the purpose of this review. However, all opinions expressed are solely their own.